Single Head Vial Sealing Machine Is Designed To Apply Alu-and Flip-off Caps On Filled And Plugged Vials. Parts coming in contact with the vial / aluminum cap /exposed to the atmosphere are made out of stainless steel, good housekeeping and good manufacturing practice. A Special clutch device is incorporated on star wheel system for stoppage of machine in the event; vial is over turned or over diameter. A photo sensing device stops machine automatically in the event, there is no aluminum cap in delivery chute. Spring loaded free spinning sealing rollers eliminates any damage to aluminum caps and also allows greater flexibility of variation in the container neck diameter. Quick & Very Easy Change Over and setting possible from one size of Container to another by a Single Ratchet. Unique Single Sealing Roller imparts uniform, scratch free, fit tight and reliable skirting and sealing. Sealing Pressure can be varied to suit different gauges and sizes of aluminum caps. Imported Gear Motor for Main drive. Allen Bradly make A.C. Frequency drives for Main drive. Digital Counter for counting number of sealed vials. “No Seal in Chute, Machine Stops System”. “No Stopper on Vial before Sealing, Machine Stops System”. 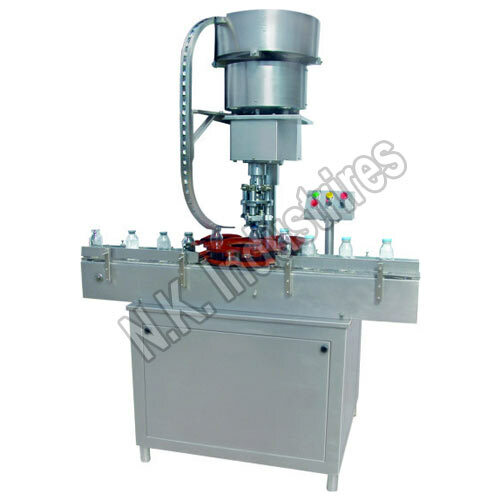 NKCS 60 , a Single head Vial sealing machine, is a compact model used for sealing of aluminum caps on vials. Duly Stopper Vials are continuously fed from the turntable of filling machine to the flat conveyor belt of sealing machine and move further through in feed worm for correct spacing and transferred to the in feed star wheel. Aluminum caps kept in vibratory bowl automatically orient caps in right direction before entering the delivery chute. Vial during its rotation movement within feed star wheel, its picks up aluminum seal from the retaining finger of delivery chute and correctly position on the vial before entering sealing turret. Vial now moves on the spring loaded sealing platform, where free spinning sealing rollers moves gradually inside to complete the sealing operation during rotational movement of sealing platform turret. Then sealed vials are transferred to the out feed conveyor for further processing.